Value is an element of art that refers to luminance or luminosity - the lightness or darkness of a color. 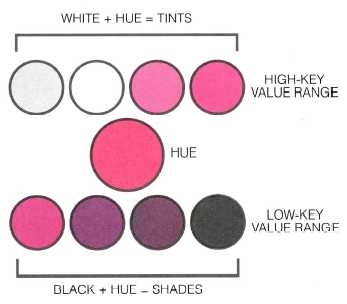 A Value Scale or a gray scale is a series of spaces filled with tints and shades of one color, starting with white or the lightest tint on one end and gradually changing into the darkest shade or black on the other end. Gradation – a drawing or painting technique in which there is a gradual change from a ton/color into another tone/color. You may use paint, pencil or any medium to create a value scale. 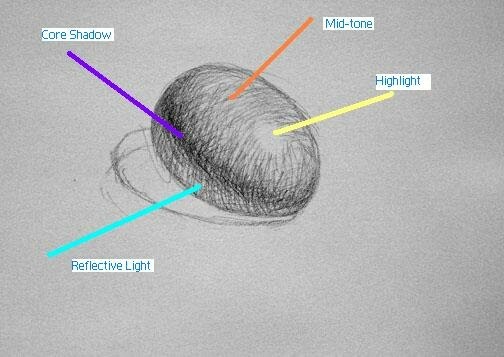 Below is an example of a value scale using pencil and cross hatching. Create a 10 step value scale using black and white tempra paint. High-Key Value is when you add white to a hue or color. This gives you different tints of the color. Low-Key Value is when you add black to a color. This gives you different shades of the color. Reflected Light - Reflective light is the light that reflects from surfaces of forms onto other surfaces surrounding the form. Reflective light is always located on a form’s shadow side. Sighting – the measurement of figures/objects in a visual way between other figures/objects in the composition. Scale – the proportion or ratio that defines the size relationships. (Models, architectural plans, maps and paintings/drawings all use scale to create the illusion of correct size relationships between objects and figures. Proportion - the correct depiction of all the parts related to each other in a shape/form within a realistic painting or drawing.